They can't be stopped with conventional pesticide. They can disable a huge industrial plant, and they short out electrical equipment. They eat animals as well as plants. Kill 100,000, and a million more ants will follow. They're the "hairy, crazy ants," and they're overrunning Texas, Mississippi, Florida and Louisiana. So many of these biting ants invaded one man's home in Mississippi, they actually made the walls of his camper bulge with the pressure of their nesting multitudes. Insecticide got rid of them for a day — and then they were back in much greater numbers. That seems to be part of why these ants are so fearsome — kill them, and they come back with multitudes. That man disappeared from his home, although it's not known if the ants were the reason he moved out. They do seem to have the tendency to be attracted to electrical equipment. I don't know why myself. They've had them in their electrical boxes, they've had them in the light switches [and] other switching mechanisms... A worker ant, if it's damaged or injured, it sets off an alarm pheromone, so instead of one you have thousands setting off a short circuit. The flea-sized ants are called "hairy" because they're covered with a dense fuzz that makes them look less glossy than other ants, to the naked eye. They're called "crazy" because each ant in a horde seems to move randomly, scrambling around so fast that the videos of them appear to be in fast-forward. They don't build anthills like other ants — instead, they prefer to nest in sheltered, moist areas. And they're spreading rapidly throughout the Southern U.S., mostly via human commerce, says Gold. They can travel inside of hay bales going to farms, or wooden pallets. We don't know where they came from originally, although experts are doing DNA testing to try and match them to species in South America. But experts believe they came in shipping containers from South America or the Caribbean, since they were originally found near ports. 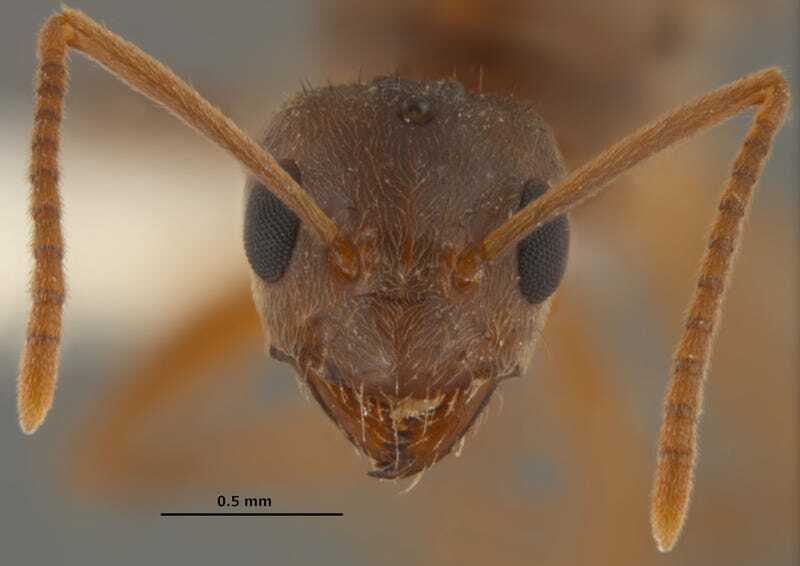 These ants do bite people, but their bite isn't dangerous, according to Gold and MacGown. "They absolutely will overrun a house," says Gold. The bite isn't that painful, they're not aggressive biters. It would just be a little nuisance. The problem is their immense numbers: hundreds of millions of workers taking over an area. They're a big nuisance. They get in electrical equipment. They've taken out honey bee hives and moved in. People are concerned with their moving about in, say, a hospital setting, carrying germs back and forth... You can walk in houses, where they're infested and you'll step on hundreds of live ants every step. I did a test site with a product early on and applied the product to a half-acre ... In 30 days I had two inches of dead ants covering the entire half-acre. It looked like the top of the dead ants was just total movement from all the live ants on top of the dead ants. The only good thing about the ants is they drive out other kinds, like fire ants, but MacGown says, "I prefer fire ants to these. I can avoid a fire ant colony." Photos via Joe McGown/Associated Press.